"Canal Zone" redirects here. For the film, see Canal Zone (film). For unofficial region in Egypt, see Suez Canal. Proposals for a canal across the Isthmus of Panama date back to 1529, soon after the Spanish conquest. Álvaro de Saavedra Cerón, a lieutenant of conquistador Vasco Núñez de Balboa, suggested four possible routes, one of which closely tracks the present-day canal. Saavedra believed that such a canal would make it easier for European vessels to reach Asia. Although King Charles I was enthusiastic and ordered preliminary works started, his officials in Panama soon realized that such an undertaking was beyond the capabilities of 16th-century technology. One official wrote to Charles, "I pledge to Your Majesty that there is not a prince in the world with the power to accomplish this". The Spanish instead built a road across the isthmus. The road came to be crucial to Spain's economy, as treasure obtained along the Pacific coast of South America was offloaded at Panama City and hauled through the jungle to the Atlantic port of Nombre de Dios, close to present day Colón. Although additional canal building proposals were made throughout the 16th and 17th centuries, they came to naught. The late 18th and early 19th centuries saw a number of canals built. The success of the Erie Canal in the United States and the collapse of the Spanish Empire in Latin America led to a surge of American interest in building an interoceanic canal. Beginning in 1826, US officials began negotiations with Gran Colombia (present-day Colombia, Venezuela, Ecuador and Panama), hoping to gain a concession for the building of a canal. Jealous of their newly obtained independence and fearing that they would be dominated by an American presence, the president Simón Bolívar and New Granadan officials declined American offers. The new nation was politically unstable, and Panama rebelled several times during the 19th century. In 1836 U.S. statesman Charles Biddle reached an agreement with the New Granadan government to replace the old road with an improved one or a railroad, running from Panama City on the Pacific coast to the Chagres River, where a steamship service would allow passengers and freight to continue to Colón. His agreement was repudiated by the Jackson administration, which wanted rights to build a canal. In 1841, with Panama in rebellion again, British interests secured a right of way over the isthmus from the insurgent regime and occupied Nicaraguan ports that might have served as the Atlantic terminus of a canal. In 1846 the new US envoy to Bogotá, Benjamin Bidlack, was surprised when, soon after his arrival, the New Granadans proposed that the United States be the guarantor of the neutrality of the isthmus. The resulting Mallarino–Bidlack Treaty allowed the United States to intervene militarily to ensure that the interoceanic road (and when it was built, the Panama Railroad as well) would not be disrupted. New Granada hoped that other nations would sign similar treaties, but the one with the United States, which was ratified by the US Senate in June 1848 after considerable lobbying by New Granada, was the only one. The treaty led the U.S. government to contract for steamship service to Panama from ports on both coasts. When the California Gold Rush began in 1848, traffic through Panama greatly increased, and New Granada agreed to allow the Panama Railroad to be constructed by American interests. This first "transcontinental railroad" opened in 1850. There were riots in Panama City in 1856; several Americans were killed. US warships landed Marines, who occupied the railroad station and kept the railroad service from being interrupted by the unrest. The United States demanded compensation from New Granada, including a zone 20 miles (32 km) wide, to be governed by US officials and in which the United States might build any "railway or passageway" it desired. The demand was dropped in the face of resistance by New Granadan officials, who accused the United States of seeking a colony. Through the remainder of the 19th century, the United States landed troops several times to preserve the railway connection. At the same time, it pursued a canal treaty with Colombia (as New Granada was renamed). One treaty, signed in 1868, was rejected by the Colombian Senate, which hoped for better terms from the incoming Grant administration. Under this treaty, the canal would have been in the middle of a 20-mile zone, under American management but Colombian sovereignty, and the canal would revert to Colombia in 99 years. The Grant administration did little to pursue a treaty and, in 1878, the concession to build the canal fell to a French firm. The French efforts eventually failed, but with Panama apparently unavailable, the United States considered possible canal sites in Mexico and Nicaragua. The Spanish–American War of 1898 added new life to the canal debate. During the war, American warships in the Atlantic seeking to reach battle zones in the Pacific had been forced to round Cape Horn. Influential naval pundits, such as Captain Alfred Thayer Mahan, urged the construction of a Central American canal. In 1902, with the French efforts moribund, US President Theodore Roosevelt backed the Panama route, and Congress passed legislation authorizing him to purchase the French assets on the condition that an agreement was reached with Colombia. In March 1902 Colombia set its terms for such a treaty: Colombia was to be sovereign over the canal, which would be policed by Colombians paid for by the United States. The host nation would receive a larger percentage of the tolls than provided for in earlier draft treaties. The draft terms were quickly rejected by American officials. Roosevelt was in a hurry to secure the treaty; the Colombians, to whom the French property would revert in 1904, were not. Negotiations dragged on into 1903, during which time there was unrest in Panama City and Colón; the United States sent in Marines to guard the trains. Nevertheless, in early 1903, the United States and Colombia signed a treaty which, despite Colombia's previous objections, gave the United States a 6 miles (9.7 km) wide zone in which it could deploy troops with Colombian consent. On August 12, 1903, the Colombian Senate voted down the treaty 24–0. Roosevelt was angered by the Colombians' actions, especially when the Colombian Senate made a counteroffer that was more financially advantageous to Colombia. A Frenchman who had worked on his nation's canal efforts, Philippe Bunau-Varilla, represented Panamanian insurgents; he met with Roosevelt and with Secretary of State John Hay, who saw to it that his principals received covert support. When the revolution came in November 1903, the United States intervened to protect the rebels, who succeeded in taking over the province, declaring it independent as the Republic of Panama. Bunau-Varilla was initially the Panamanian representative in the United States, though he was about to be displaced by actual Panamanians, and hastily negotiated a treaty, giving the United States a zone 20 miles (32 km) wide and full authority to pass laws to govern that zone. 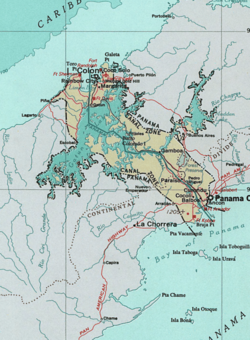 The Panama Canal Zone (Canal Zone, or Zone) excluded Panama City and Colón, but included four offshore islands, and permitted the United States to add to the zone any additional lands needed to carry on canal operations. The Panamanians were minded to disavow the treaty, but Bunau-Varilla told the new government that if Panama did not agree, the United States would withdraw its protection and make the best terms it could with Colombia. The Panamanians agreed, even adding a provision to the new constitution, at US request, allowing the larger nation to intervene to preserve public order. The treaty was approved by the provisional Panamanian government on December 2, 1903, and by the US Senate on February 23, 1904. Under the treaty, Panama received US$10 million, much of which the United States required to be invested in that country, plus annual payments of US$250,000; with those payments made, as well as for the purchase of the French company assets, the Canal Zone was formally turned over by Panama on May 4, 1904, when American officials reopened the Panama City offices of the canal company and raised the American flag. This marked the beginning point for U.S. excavation and construction which concluded in August 1914 with the opening of the canal to commercial traffic. By order of President Theodore Roosevelt under the Panama Canal Acts of 1902 and 1904 the Secretary of War was made supervisor of canal construction and the second Isthmian Canal Commission made the governing body for the Canal Zone. Under the Panama Canal Act of May 24, 1912 President Woodrow Wilson issued Executive Order 1885, January 27, 1914, effective April 1, 1914 abolishing the previous governance placing it under the direction of the Secretary of War with the entity designated as The Panama Canal. The Governor of the Panama Canal was charged with "completion, maintenance, operation, government and sanitation of the Panama Canal and its adjuncts and the government of the Canal Zone" in the Executive Order. A number of departments were specified in the order with others to be established as needed by the Governor of the Panama Canal with approval of the President and under the supervision of the Secretary of War. Defense of the canal was the responsibility of the Secretary of War who retained control of troops with provisions for Presidential appointment of an Army officer in wartime who would have "exclusive authority over the operation of the Panama Canal and the Government of the Canal Zone." The Executive Order noted in closing "that the supervision of the operations of the Panama Canal under the permanent organization should be under the Secretary of War" thus establishing the essentially military arrangement and atmosphere for the canal and Canal Zone. Effective July 1, 1951, under an act of Congress dated September 26, 1950 (64 Stat. 1038), governance of the Canal Zone was through the Canal Zone Government with the canal operated by the Panama Canal Company until 1979 when the Panama Canal Commission took over its governance. The entire structure was under the control of the United States government with the Secretary of the Army appointing the Panama Canal Company board of directors and the Canal Zone Government was entirely financed by the company. The office of Governor of the Panama Canal Zone was not usually a stepping stone to higher political office but a position given to a US Army active duty general officers of the United States Army Corps of Engineers. The Governor was also President of the Panama Canal Company. The Canal Zone had its own police force (the Canal Zone Police), courts, and judges (the United States District Court for the Canal Zone). Despite being an unincorporated territory, the Canal Zone was never granted a congressional delegate. Everyone worked for the company or the government in one form or another. Residents did not own their homes; instead, they rented houses assigned primarily based on seniority in the zone. When an employee moved away, the house would be listed and employees could apply for it. The utility companies were also managed by the company. There were no independent stores; goods were brought in and sold at stores run by the company, such as a commissary, housewares, and so forth. In 1952 the Panama Canal Company was required to go on a break-even basis in an announcement made in the form of the President's budget submission to the United States Congress. Though company officials had been involved in previewing the requirement, there was no disclosure in advance, even though the Bureau of the Budget directed that the new régime become effective on March 1. The company organization was realigned into three main divisions; Canal Activity and Commercial Activity with the Service Activity providing services to both operating activities at rates sufficient to recover costs. Rate adjustments in housing and other employee services would be required and a form of valuation, compared to a property tax, would be used to determine each division's contribution to the Canal Zone Government. In 1903, the United States, having failed to obtain from Colombia the right to build a canal across the Isthmus of Panama, which was part of that country, sent warships in support of Panamanian independence from Colombia. This being achieved, the new nation of Panama ceded to the Americans the rights they wanted in the Hay–Bunau-Varilla Treaty. Over time, though, the existence of the Canal Zone, a political exclave of the United States that cut Panama geographically in half and had its own courts, police, and civil government, became a cause of conflict between the two countries. Major rioting and clashes occurred on May 21, 1958 and on November 3, 1959. Demonstrations occurred at the opening of the Thatcher Ferry Bridge, now known as the Bridge of the Americas, in 1962 and serious rioting occurred in January 1964. This led to the United States easing its controls in the Zone. For example, Panamanian flags were allowed to be flown alongside USA ones. After extensive negotiations, the Canal Zone ceased to exist on October 1, 1979, in compliance with provisions of the Torrijos–Carter Treaties. During its construction and into the 1940s, the labor force in the Canal Zone (which was almost entirely publicly employed) was divided into a "gold" roll (short for payroll) classification, and a "silver" roll classification. The origins of this system are unclear, but it was the practice on the 19th-century Panama Railroad to pay Americans in US gold and local workers in silver coin. Although some Canal Zone officials compared the gold roll to military officers and the silver roll to enlisted men, the characteristic that determined on which roll an employee was placed was race. With very few exceptions, American and Northern European whites were placed on the gold roll, and blacks and southern European whites on the silver roll. American blacks were generally not hired; black employees were from the Caribbean, often from Barbados and Jamaica. American whites seeking work as laborers, which were almost entirely silver roll positions, were discouraged from applying. In the early days of the system, bosses could promote exceptional workers from silver to gold, but this practice soon ceased as race came to be the determining factor. As a result of the initial policy, there were several hundred skilled blacks and southern Europeans on the gold roll. In November 1906, Chief Engineer John Stevens ordered that most blacks on the gold roll be placed on the silver roll instead (a few remained in such roles as teachers and postmasters); the following month, the Canal Commission reported that the 3,700 gold roll employees were "almost all white Americans" and the 13,000 silver roll workers were "mostly aliens". On February 8, 1908, President Roosevelt ordered that no further non-Americans be placed on the gold roll. After Panamanians objected, the gold roll was reopened to them in December 1908; however, efforts to remove blacks and non-Americans from the gold roll continued. Until 1918, when all employees began to be paid in US dollars, gold roll employees were paid in gold, in American currency, while their silver roll counterparts were paid in silver coin, initially Colombian pesos. Through the years of canal construction, silver roll workers were paid with coins from various nations; in several years, coin was imported from the United States because of local shortages. Even after 1918, both the designations and the disparity in privileges lingered. Until the end of World War II in 1945, the Panama Canal Zone operated under a Jim Crow society, where the category of "gold" represented white, U.S. workers and the title "silver" represented the non-white, non-U.S. workers on the Zone. After the strike of 1920, the Afro diasporic workers were banned from unionizing by the U.S. Canal officials. As a result, the Panama Canal West Indian Employees Association (PCWIEA) was created in 1924 to fill this vacuum of representation. The PCWIEA did not garner much support on the Canal Zone because of its restrictive membership policies and the haunting of the 1920 strike and its damaging consequences. However, in 1946, the PCWIEA summoned the Congress of Industrial Organizations (CIO) for representation and the establishment of a local union. In July of that year, the West Indian and Panamanian workers received a charter for Local 713 of the United Public Workers of America (UPWA)-CIO. Together, with the assistance of U.S. representatives for the Local, these Afro-diasporic workers came together to secure material benefits in their livelihoods. They organized together in order to pose a serious threat to the Jim Crow system which resulted, however, only in minimal gains. The imperial system of the U.S. and its segregationist policies persisted as it related to housing and schooling. In the end, ties to communism destroyed the UPWA and as a result Local 713 collapsed. Nevertheless, it is important to see this as a moment of what Frank Gurridy describes as diasporization, “diaspora in action, or the ways Afro-diasporic linkages were made in practice”. In the case of the Panama Canal Zone, these linkages were made not only by the West Indian and Panamanian communities, but also between the Afro descended workers on the Zone and African Americans, on the mainland of the U.S., through the transnational struggle to dismantle the system of Jim Crow. Canal Zone housing was constructed in the early days of construction, as part of Stevens' plans. Housing constructed for couples and families consisted of structures containing four two-story apartments. The units had corrugated-iron roofs, and were uniformly painted gray with white trim. Constructed of pine clapboard, they had long windows and high ceilings, allowing for air movement. Better-paid employees were entitled to more square feet of housing, the unit in which allowances were expressed. Initially, employees received one square foot per dollar of monthly salary. Stevens from the first encouraged gold roll employees to send for their wives and children; to encourage them to do so, wives were granted a housing allowance equal to their husband's, even if they were not employees. Bachelors mostly resided in hotel-like structures. The structures all had screened verandas and up-to-date plumbing. The government furnished power, water, coal for cooking, ice for iceboxes, lawn care, groundskeeping, garbage disposal, and, for bachelors only, maid service. In the first days of the Canal Zone, the ICC provided no food, and workers had to fend for themselves, obtaining poor-quality food at inflated prices from Panamanian merchants. When Stevens arrived in 1905, he ordered food to be provided at cost, leading to the establishment of the Canal Zone Commissary. The functions of the Commissary quickly grew, generally against the will of the Panamanian government, which saw more and more goods and services provided in the Zone rather than in Panama. Merchants could not compete with the commissary's prices or quality; for example, it boasted that the meat it sold had been refrigerated every moment from the Chicago slaughterhouse to the moment it was passed to the consumer. By 1913, it consisted of 22 general stores, 7 cigar stores, 22 hostels, 2 hotels, and a mail-order division. It served high-quality meals at small expense to workers and more expensive meals to upper-echelon canal employees and others able to afford it. The commissary was a source of friction between the Canal Zone and Panama for several other reasons. The commissary dominated sales of supplies to passing ships. The commissary was off limits to individuals who were not in the U.S. Military, employees of the Panama Canal Company, the Canal Zone Government and/or their dependents. This restriction was requested by Panama for the benefit of Panamanian storekeepers, who feared the loss of trade. Panama had laws restricting imports from the Canal Zone. Goods from the commissary would sometimes show up in Panamanian stores and in vendor displays, where Comisariato goods were deemed of high quality. Additionally, there were separate commissaries on the U.S. military installations that were available only to the U.S. Military personnel and their dependents. Employees and dependents of the Panama Canal Company/Government were not allowed to utilize the commissaries, exchanges, package stores, theaters, gas stations, and other facilities on the U.S. Military installations. Canal Zone Courthouse site of the Canal Zone District Court which existed from 1914 until 1982. Although the Panama Canal Zone was legal territory of the United States until the implementation of the Torrijos–Carter Treaties in 1979, questions arose almost from its inception as to whether it was considered part of the United States for constitutional purposes, or, in the phrase of the day, whether the Constitution followed the flag. In 1901 the US Supreme Court had ruled in Downes v. Bidwell that unincorporated territories are not the United States. On July 28, 1904, Controller of the Treasury Robert Tracewell stated, "While the general spirit and purpose of the Constitution is applicable to the zone, that domain is not a part of the United States within the full meaning of the Constitution and laws of the country." Accordingly, the Supreme Court held in 1905 in Rasmussen v. United States that the full Constitution only applies for incorporated territories of the United States. The treaty with Panama made no mention of the nationality status of the native inhabitants of the Zone. Pursuant to the principles of international law, they became non-citizen U.S. nationals unless they elected to retain their previous nationality. Children of non-citizen U.S. nationals generally acquired the status of their parents. However, for most nationality purposes, the Canal Zone was considered to be foreign territory and the status persons acquired at birth was governed by the Naturalization Act of 1795, which granted them statutory US citizenship at birth but only if their fathers were, at the time of the child's birth, U.S. citizens who had previously resided in the United States. In 1934 the law was amended to allow for citizenship to be acquired at birth through either parent if the parent was a U.S. citizen who had previously resided in the United States. In 1937 the law was further amended to provide for US citizenship to persons born in the Canal Zone (since 1904) to a U.S. citizen parent without that parent needing to have been previously resident in the United States. The law is now codified under title 8, section 1403. It not only grants statutory and declaratory born citizenship to those born in the Canal Zone after February 26, 1904, of at least one US citizen parent, but also does so retroactively for all children born of at least one US citizen in the Canal Zone before the law's enactment. This rule was later rendered moot when the rules were changed to state that (almost all) children born to U.S. citizens anywhere in the world were considered U.S citizens. In 2008, during a minor controversy over whether Canal Zone–born John McCain, born in the Zone in 1936, was legally eligible for the presidency, the US Senate passed a non-binding resolution that McCain was a "natural born Citizen" of the United States. John McCain, the Republican 2008 presidential candidate and former US Senator from Arizona. Frederick Wiseman made the film Canal Zone, which was released and aired on PBS in 1977. The Canal Zone was generally divided into two sections, the Pacific side and the Atlantic side, separated by Gatun Lake. Gorgas Hospital was built by the French as L'Hospital Notre Dame de Canal in 1882, renamed Ancon Hospital when the U.S. assumed control in 1904, rebuilt in 1915 and finally renamed in honor of William C. Gorgas in 1928. It is now home to Panama's Ministry of Health and the Instituto Oncologico Nacional. Ancón – built on the lower slopes of Ancon Hill, adjacent to Panama City. Also home to Gorgas Hospital. Balboa – the Zone's administrative capital, as well as location of the harbor and main Pacific-side high school. Cardenas – as the Canal Zone was gradually handed over to Panamanian control, Cardenas was one of the last Zonian holdouts. Gamboa – headquarters of dredging division, located on Gatun Lake. Many new arrivals to the Canal Zone were assigned here. La Boca – home of the Panama Canal College. Red Tank – abandoned and allowed to be overgrown around 1950. 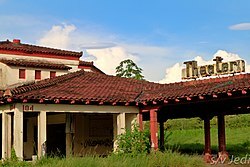 Rosseau – built as a naval hospital during World War II, housed FAA personnel until Cardenas was built. Torn down after about 20 years. Fort Clayton – on the east side of the canal, it was the headquarters of the 193rd Infantry and the Southern Command Network (SCN), an American Forces Radio and Television Service (AFRTS) outlet. Corozal Army Post – close to, but separate from, the civilian township. Quarry Heights – headquarters of the United States Southern Command. Brazos Heights: privately owned housing (by United Brands and other, mostly shipping companies) where employees and owners of shipping agencies, lawyers, and the head of the YMCA lived. Coco Solo – main hospital and site of the only Atlantic-side high school, Cristobal High School. Cristóbal – main harbor and port. Mount Hope – site of the only Atlantic-side cemetery and drydock. Fort Gulick – home to the School of the Americas. Fort Randolph – located on Margarita Island in Manzanillo Bay. Fort De Lesseps – located in Colón. Fort Sherman – home to Jungle Operations Training Center. On 1 October 1979, the day the Panama Canal Treaty of 1977 took effect, most of the land within the former Canal Zone transferred to Panama. However, the treaty set aside many Canal Zone areas and facilities for transfer during the following 20 years. The treaty specifically categorized areas and facilities by name as “Military Areas of Coordination”, "Defense Sites" and "Areas Subject to Separate Bilateral Agreement". These were to be transferred by the U.S. to Panama during certain time windows or simply by the end of the 243-month treaty period. On 1 October 1979, among the many such parcels so designated in the treaty, 35 emerged as enclaves (surrounded entirely by land solely under Panamanian jurisdiction). In later years as other areas were turned over to Panama, nine more enclaves emerged. At least 13 other parcels each were enclosed partly by land under the absolute jurisdiction of Panama and partly by an “Area of Civil Coordination" (housing), which under the treaty was subject to elements of both U.S. and Panamanian public law. In addition, the 1977 treaty designated numerous areas and individual facilities as “Canal Operating Areas” for joint U.S.-Panama ongoing operations by a commission. On the effective date of the treaty, many of these, including Madden Dam, became newly surrounded by the territory of Panama. Just after noon local time on 31 December 1999, all former Canal Zone parcels of all types had come under the exclusive jurisdiction of Panama. The 44 enclaves of U.S. territory that existed under the treaty are shown in the table below. * Enclaves are a subset of those areas that were categorized in the 1977 Panama Canal Treaty as "Military Area of Coordination", "Defense Site" and "Area Subject to Separate Bilateral Agreement". The map legends and color coding that are contained in the Panama Canal Treaty Annex provide visual corroborations of the treaty language. Two Canal Zone stamps showing precancels. The Panama Canal Zone issued its own postage stamps from 1904 until October 25, 1978. After a transition period, Panama administered the stamps. The two-letter state abbreviation for mail sent to the Zone was CZ. Amateur radio licenses were issued by the United States Federal Communications Commission and carried the prefix KZ5, the initial 'K' indicating a station under American jurisdiction. The American Radio Relay League had a Canal Zone section, and the Canal Zone was considered an entity for purposes of the DX Century Club. Contacts with Canal Zone stations from before repatriation may still be counted for DXCC credit separate from Panama. ^ Liptak, Adam. "A Hint of New Life to a McCain Birth Issue", New York Times (July 11, 2008). ^ a b Maurer and Yu, pp. 15–18. ^ Maurer and Yu, pp. 33–34. ^ Maurer and Yu, pp. 35–36. ^ Maurer and Yu, p. 76. ^ Maurer and Yu, pp. 78–82. ^ Maurer and Yu, pp. 82–86. ^ McCullough, pp. 397–399, 402. ^ a b NARA: 185.6 RECORDS OF THE SECOND ISTHMIAN CANAL COMMISSION 1904–16. ^ a b c d e Wilson, Executive Order 1885. 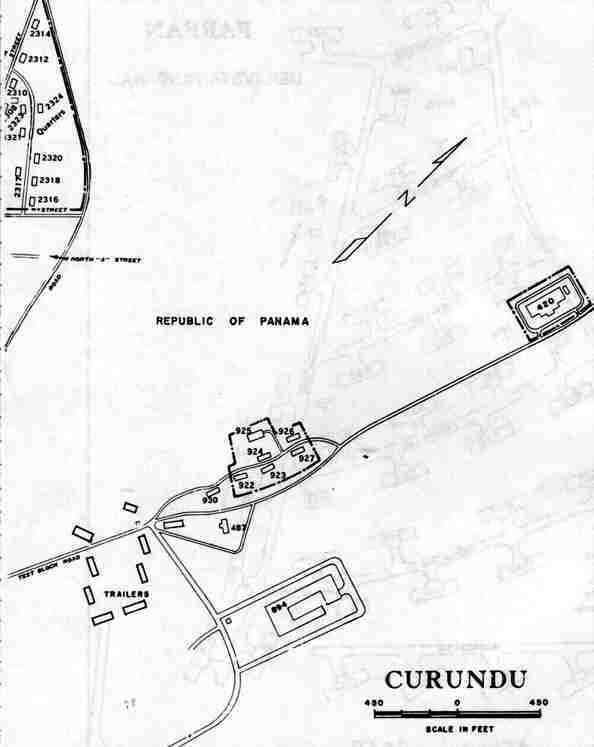 ^ NARA: RECORDS OF THE CANAL ZONE GOVERNMENT AND THE PANAMA CANAL COMPANY 1904-84. ^ Maurer & Yu 2011, p. 251. ^ Maurer & Yu 2011, p. 252. ^ a b The Panama Canal Review, February 1, 1952, p. 1. ^ The Panama Canal Review, February 1, 1952, pp. 1, 13. ^ The Panama Canal Review, February 1, 1952, p. 13. ^ a b Major, pp. 78–81. ^ a b Maurer and Yu, p. 111. ^ Maurer & Yu, pp. 111–112. ^ Kaysha Lisbeth Corinealdi, "Redefining Home: West Indian Panamanians and Transnational Politics of Race, Citizenship, and Diaspora, 1928–1970” (PhD diss., Yale University, 2011), 43. ^ “Canal Zone Workers Rally to CIO: Plan Program,” Chicago Defender, August 31, 1946. ^ Michael Conniff, Black Labor on a White Island: Panama, 1904–1981 (Pittsburgh: University of Pittsburgh Press, 1985), 113. ^ Frank Gurridy, Forging Diaspora: Afro-Cubans and African Americans (Chapel Hill: The University of North Carolina Press, 2010), 5. ^ Maurer and Wu, pp. 192–94. ^ Maurer and Wu, pp. 194–96. ^ Knapp and Knapp, pp. 183–84. ^ United States Supreme Court, Downes v. Bidwell. ^ United States Supreme Court, . ^ Cf. 8 U.S.C. § 1403, paragraph (a): "whether before or after the effective date of this chapter". ^ FindLaw. "U.S. Citizenship Through Parents or by Birth". Retrieved February 23, 2016. ^ Impomeni, Mark. Clinton, Obama Sponsor McCain Citizenship Bill. PoliticsDaily.com. May 2008. Retrieved 2016-01-12. ^ "Earl Holmes Bell (1955–)". The Encyclopedia of Arkansas History & Culture. Retrieved June 5, 2013. ^ Eames, David (October 2, 1977). "Watching Wiseman Watch". New York Times. Retrieved December 30, 2017. ^ Treaty concerning the permanent neutrality and operation of the Panama Canal, with annexes and protocol. Signed at Washington September 7, 1977. Entered into force October 1, 1979, subject to amendments, conditions, reservations, and understandings. 33 UST 1; TIAS 10029; 1161 UNTS 177. ^ United States. Central Intelligence Agency. (1987). "Land and waters of the Panama Canal Treaty (map)". Washington, D.C. Retrieved July 15, 2015. ^ "Carte IV. 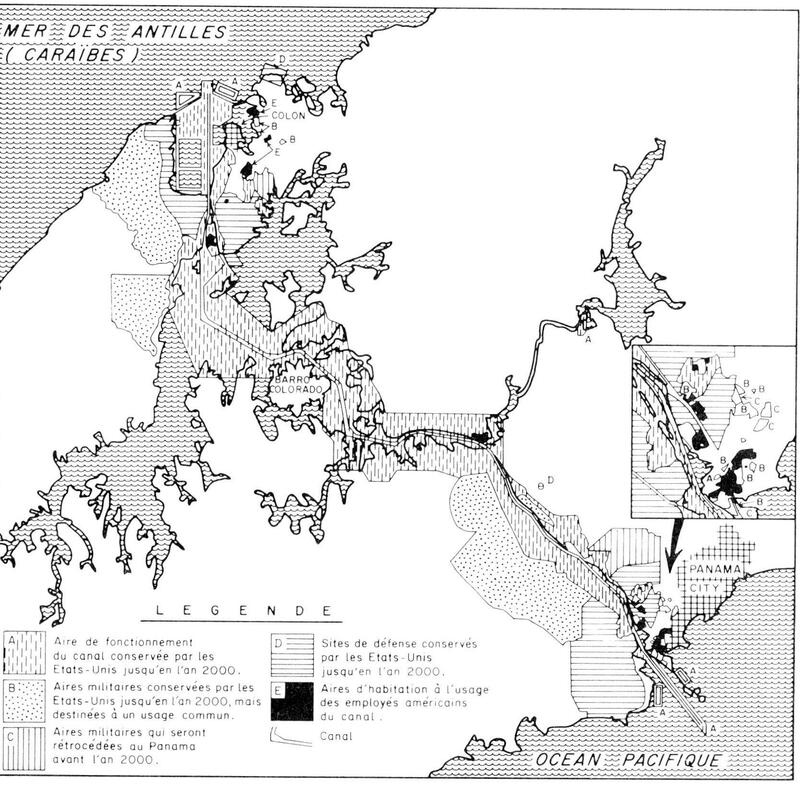 Aires de terre et d'eau mises à disposition du fonctionnement et de la défense du canal de Panama par le traité relatif au canal de Panama du 7 septembre 1977". Dirección ejecutiva para los asuntos del tratado (DEPAT). Ciudad de Panama. 1981. Retrieved July 11, 2015. ^ Panama Canal Treaty: Implementation of Article IV (TIAS 10032). United States Treaties and Other International Agreements. 33. United States Department of State. 1987. pp. 307–432. ^ Ormsbee, William H. "PANAMA CANAL TREATY TRANSITION (OCTOBER 1979 - DECEMBER 1999)". Retrieved July 11, 2015. ^ Ormsbee, William H. "PANAMA CANAL TREATY TRANSITION - MILITARY. SUMMARY OF MILITARY PROPERTY TRANSFERS AND MILITARY FORCES DRAWDOWN". Retrieved July 11, 2015. ^ "Canal Zone Map Section. Curundu 1". Retrieved July 23, 2015. ^ Company, Panama Canal. The Panama Canal review. Panama Canal Co. p. 103. Retrieved December 30, 2017. ^ "ARRL DXCC LIST – DELETED ENTITIES" (PDF). American Radio Relay League. May 2017. Retrieved December 30, 2017. Donoghue, Michael E. (2014). Borderland on the Isthmus: Race, Culture, and the Struggle for the Canal Zone. Durham, NC: Duke University Press. Greene, Julie (2009). The Canal Builders: Making America's Empire at the Panama Canal. New York: The Penguin Press. Harding, Robert C. (2001). Military Foundations of Panamanian Politics. Transaction Publishers. Harding, Robert C. (2006). The History of Panama. Greenwood Publishing. Governments of the United States of America and the Republic of Panama. "Panama Canal Treaty". Retrieved January 17, 2014. Knapp, Herbert and Knapp, Mary (1984). Red, White and Blue Paradise: The American Canal Zone in Panama. San Diego: Harcourt, Brace, and Jovanovich. ISBN 0-15-176135-3. Major, John (1993). Prize Possession: The United States and the Panama Canal, 1903–1979. Cambridge: Cambridge University Press. ISBN 978-0-521-52126-0. Maurer, Noel; Yu, Carlos (2011). The Big Ditch: How America Took, Built, Ran, and Ultimately Gave Away the Panama Canal. Princeton, New Jersey: Princeton University Press. ISBN 978-0-691-14738-3. LCCN 2010029058. Retrieved January 17, 2014. McCullough, David (1977). The Path Between the Seas: The Creation of the Panama Canal, 1870–1914. New York: Simon and Schuster. ISBN 978-0-671-24409-5. NARA. "185.6 RECORDS OF THE SECOND ISTHMIAN CANAL COMMISSION 1904-16—History". National Archives and Records Administration (NARA). Retrieved January 18, 2014. NARA. "185.8 RECORDS OF THE CANAL ZONE GOVERNMENT AND THE PANAMA CANAL COMPANY 1904–84—History". National Archives and Records Administration (NARA). Retrieved January 18, 2014. "Canal Company to go on Break Even Basis". The Panama Canal Review. February 1, 1952. Retrieved January 17, 2014. Wiseman, Frederick (1977). Canal Zone (motion picture). Zipporah Films. Woodrow Wilson (January 27, 1914). "Executive Order 1885 - To Establish a Permanent Organization for the Operation and Government of the Panama Canal". President of the United States. Retrieved January 18, 2014. Wikimedia Commons has media related to Panama Canal Zone.